It was a hot day late in June as Ben and Chip and I stopped for a breather. We were skidding fir and larch logs to the landing and things were not going very well. Ben, the younger gelding, had been acting up quite a bit and was getting more and more annoyed with horse flies as the day got warmer. I was getting mad at Ben and wondered what I should do to get him to behave. I couldn’t afford many foul-ups as I was behind at the bank. But somehow Ben didn’t seem to appreciate that fact. I sat down for a moment to rest and wondered how a man of 42 years of age could end up logging with a stubborn horse in the forests of British Columbia in 1988. Instantly, my mind began to race back to a time 30 years earlier and 2500 miles away, and to a man who, unknowingly, had a profound influence on my life. I remember old “Doc” Weller from the neighboring farm who used to raise purebred Belgian horses. His grandson, Artie McMullen, and I were best of friends and on rainy days we’d explore the old horse barn that only a few years previously had housed some of the best horses in the Pittsburgh area. The names of the horses were still above the stalls. 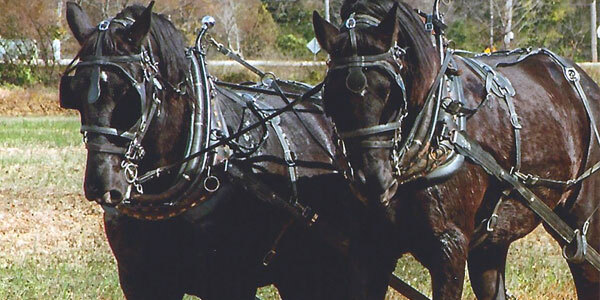 And the Sinan boys, who were 2 & 3 years older than I, had a big team of Percherons that they still used occasionally. I remember standing behind those horses thinking that they were the biggest animals that I had ever seen. One summer while trimming Christmas trees on the Caywood farm, I heard what sounded like a machine without a motor working. I snuck through the trees, and there was Mr. Remaley with his team of horses mowing hay. It looked to me to be so much more enjoyable and practical than driving a loud, expensive tractor. But it wasn’t any of these people who I knew well, that had influenced me to log and farm with horses. What turned out to be one of the most influential days of my young childhood began late in the summer of one of those years. The passing of time has blurred the exact date, but it must have been around September of ‘58 or ‘59. It was one of the days of the Westmoreland County Fair. I remember going to the fair with our neighbors, the Bassett family. They showed their riding horses there each summer and I got to tag along. A fair is a wonderful place for a young boy. Fat, sleek cattle stand knee deep in bright yellow straw. Shiny new tractors and machinery seem to be everywhere. Riding horses, sheep, and pigs are proudly displayed with the ribbons they’ve won. The sound of laughter, neighbors visiting, and hucksters hawking their wares fill the air. And hot dogs, hamburgers, candy apples and all sorts of good things to eat can be bought with money saved over the summer. But to me, this was all just a prelude to the main attraction – the heavy horse pulling contest. It began a couple hours before dark. I remember the stands starting to fill up. I was one of the first people there. I could feel the excitement of the crowd as the horses were brought into the arena. People around me were picking out their favorite teams and telling about the local champions. Two teams stand out clearly in my mind. One was a nicely proportioned team of big red roans, and one was a truly huge pair of sorrel horses. I remember thinking that none of the other teams could possibly beat that giant team of sorrel horses. The contest began with around 10-15 different teams. It was a small fair and there was only one weight class, which meant whatever team pulled the most weight the full distance, won. Most of the teamsters appeared to be local farmers with rather common horses and harness. But the sorrel team stood out in appearance with its polished heavy harness with fancy nickel-plated adornments. The first pulls were made and the crowd could start to tell which teams knew their business. The big sorrel team pulled extremely well. It was obvious that the teamster who drove them was a professional who traveled from contest to contest. But a young boy has an innate ability to determine a man’s character, and I didn’t like this man. He was rough and abusive with his horses. I supposed that was what it took to control such big animals. They certainly pulled the sled effortlessly. I found myself rooting for the man with the red roans. They too were a very good performing team, but the teamster that drove them was calm and gentle with his horses. The contest continued into the evening. The night got cool and the older people bought a lot of coffee and hot food from the concession to keep warm. But I wasn’t about to move. The sorrels and the red roans seemed to have the contest largely to themselves. But those Pennsylvania farmers were no easy competition. It seemed to go on and on as more weight was added. The grandstand lights came on and some people in the crowd started to get bored. More weight was added. Finally the teams started to get thinned out. I can’t remember the weight at that time, but it had grown to a huge pile of concrete blocks on the back of that sled. The crowd started to get thinned out as well, some saying that it was getting too cold. I remember running to get a cup of hot chocolate. When I came back, I first noticed a man that I’ve never forgotten. The contest was now down to about five teams, the sorrels and the red roans included. But another team was becoming apparent. A man who appeared to be a farmer with a rather small and common looking pair of blacks was doing very well. Earlier he was hardly noticeable because of the quiet, unassuming and matter-of-fact way he and his horses went about their business. It looked as though it was getting hard for his blacks to start the heavier loads, but once moving, they didn’t stop until the whistle blew. Finally, the contest was between the sorrels, the red roans and the blacks. I found myself studying the men driving these horses even more than I was comparing the horses. I had truly come to dislike the man driving the sorrels. He was very rough and abusive with those big horses and seemed to be having a harder time controlling them as the weights got heavier. However, once they started to pull, the sled still moved effortlessly. The man driving the red roans was a good teamster and his horses responded well to his commands. However, although they were big, they weren’t the size of the sorrels. I hoped he would come in first, although I suspected he would take second. But I found myself forming an invisible bond with the man driving that small team of blacks. He was so calm and quiet with those horses as to be almost unnoticeable. When he asked them to pull, they slowly leaned into the collars and moved that sled until the whistle blew. However, the blacks were so much smaller than the other teams that I knew they couldn’t possibly win the contest. Their owner, however, showed no indication that he thought they couldn’t possibly win the contest. Then, rather unexpectedly, the roan team couldn’t pull the load the distance and was disqualified. That left only the giant sorrels and the small blacks. The sorrels were brought up and were now getting quite hard to manage. But when their driver finally got them hooked up, they took a mighty run at the tug chains and the sled moved almost as though there was no weight at all behind them. It was now the blacks turn, or should I say the Pennsylvania farmer’s turn. He seemed to have an unbreakable line of communication with those horses. He calmly asked them to lean into the traces. They then put forward what seemed to be a difficult effort, but they went the distance. A young boy’s emotions run quite high in a situation like that, and I’m not sure I can clearly remember the details after so many years. But it seems to me that three more pulls were made with no noticeable affect on the big sorrels, but each pull seemed increasingly hard on the blacks. I began to ask myself how that farmer could train two horses to perform so well for him like that. Although the horses did the pulling, I suspected that it was mostly the man behind the horses that was responsible for their good performance. I felt sure that his calm, gentle and loving manner had a lot to do with it. After every pull he retreated to the shadows and softly patted their noses and carefully checked the harness for any signs of breakage. But it had to be more. Did his father teach him to train horses like that, or did he learn by trial and error and years of patience? Certainly he must have worked daily in the fields and forests to condition them so they wouldn’t hurt themselves. The remaining crowd was becoming anxious to leave. Already 75% had done so and everyone knew the big team would win anyway. A double weight was put on to end the competition. The sorrels were up first. By this time they were almost wild with tension and the crowd was in agreement in their dislike of the man driving them. But as of yet, after being hitched with great difficulty, they’d made every pull effortlessly. Finally they got hooked up and instantly took a wild leap at the tug chains!… But they were out of control and didn’t pull evenly! One horse hit his collar first and the double tree pulled the other one back! The confusion, uneven pull and the heavy stone boat combined to pull those big horses back on their haunches, their driver yelling abusively at them all the while. At this point, the crowd quickly began to leave. They knew that if that giant team of sorrels couldn’t move that load, neither could the little team of blacks. I sat glued to my seat in a near trance! That Pennsylvania farmer then did something he had not done previously. I can remember it as clearly as I remember my own name. He calmly hooked his horses up and then walked to their heads. After talking to them quietly for a few moments, he gently pulled them ahead so they were leaning into their collars and the chains were tight. The blacks remained in that position, while their owner returned to his seat. At his command, and not before, they evenly began to pull. I could see the muscles under their sweat-glistened coats tighten up as they began to strain. Their stomachs nearly touched the ground, as their hindquarters started to slightly lift the front of that stone boat off the ground. After what seemed an eternity, that sled began to move! A roar rose up from the remaining crowd such that those leaving the stands came racing back to their seats to see what was happening! Those blacks continued to pull until the whistle said they’d gone the full distance. It was as if they knew they could safely pull the full distance because the Pennsylvania farmer knew they could do it, and he never asked them to stop. They won the contest fair and square for all to see. Was that a softening in Ben’s eye that I detected when I mentioned the words, Pennsylvania farmer? I’ll never know for sure. It may simply have been the mist in my own eyes.